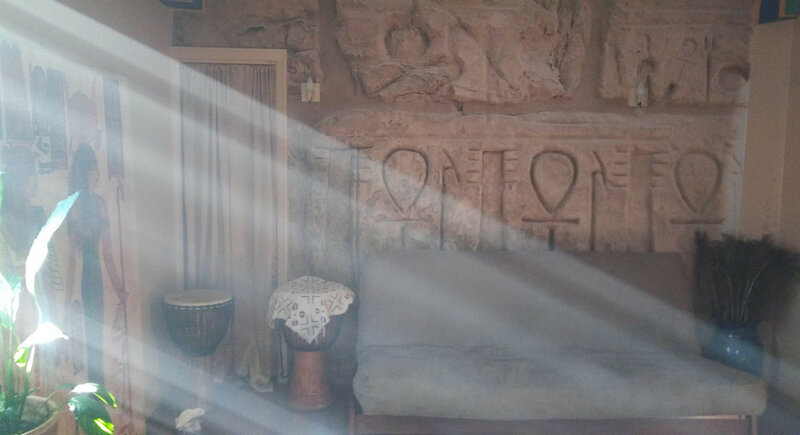 Mutshat Shemsut has created a safe, peaceful, sacred oasis in which to channel healing energy medicine that balances and cleanses the aura and brings her client's aritu (chakras) into balance. There is consultation and continuing support. The space is routinely purified by herbal scents and is charged by other purposeful and uplifting natural elements. 1st Session - $117, 2nd session $90, following sessions $54 --sliding. Can’t make it to the Bronx? The power of Ra Sekhi energy medicine can be used to heal where ever you are in the world! You do not have to be physically present. Energy medicine transcends time and space. We will simply set up an appointment for your session at your convenience at a time when you are in a physical place of quiet and peace. Ra Sekhi for couples is a special energy medicine that will help to clear away old arguments and confusion. Guided energy clearing with Mutshat helps strengthen the bond of a couple, establishing a place of peace together with a focus on healing old wounds and releasing blockages, as well as encouraging unconditional love and balance.